The vast experience and literary wisdom that he possesses extends beyond boundaries. Spend minutes with him and you will walk away amused, enlightened and enriched. Almost ninety years old, he has his own way of amusing you with his jovial and interesting set of stories from the days gone by. As he fascinates you with his intriguing interpretations of traditional Sinhala riddles and narrate double-edged connotations of traditional poetic pieces, the clock stops ticking and you get trapped in his enthralling literary sanctuary. “Arts is a pattern woven differently in the minds of different people according to the impulses set up by the reaction of the senses,” he gives his own definition for what ‘ART’ is all about. 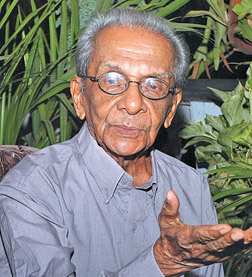 Crowned with “Hela Bas Mini” title in 1993 and “Kala-Bhushana” title in 2003, the tremendous services that he has done to enrich Sinhala literature and art cannot be measured with mere words. Among other literary greats, may be he is an unsung hero. As his own son Sanath Coperahewa puts it, “many young people don’t even know who he is. But the services that he has done to literature and arts are out there for everyone to witness and people should know about him more.” An ardent and much loved teacher, a poet, a translator and a scholar on Sinhalese Literature, Sandadas Coperahewa is our this Week’s Encounter. Q: Your path to success was laid during your school days at S Thomas College Mount Lavinia. Can you recall some of those interesting memories from your school days? A: Till fourth grade I studied at Pamburana Sariyuth College. I was nine when I went to St Thomas College Mount Lavinia. It was an interesting period in my life and I have even written a recollection of all my memories during the school in to a book which has not been published yet. As for interesting times in St Thomas’s, I remember, we had this nice looking lady who used to teach English for us. When she came to class, she used to say, ‘Now boys don’t look at me, you won’t get anything by looking at me. I am putting these verses on board, please study them and know them by-heart’. However when she asked from students to recall those verses next day, no one could recite them. I was the only one who was able to recite those verses and even today after all these years I still remember those lines (he says while reciting verses that he was suppose to study ages ago). There was also this one time where I copied the whole of Arthur Conan Doyle’s Hound of Baskervilles in to an exercise book because I didn’t have the money to buy the book. Q: As a scholar who has mastered both English and Sinahala language proficiently, share some of your thoughts about the richness of Sinhala language. A: There is great brevity of speech in Sinahal language. Gurulugomi gives a fine account of this when he describes the congregation ceremony during King Dutugamunu’s time. When they were about to place the relics in Dagaba, Sonuththara thera finds that relics were taken to naga loka. It says that they couldn’t find the relics and those relics were taken to ‘Naga Loka’. However, it says that with his power, he entered the Naga loka and came back with the relics. He came to Dutugamnu with relics and said three words, ‘Dai Maley Inse’ which in English would mean ‘what I am presenting are the relics of Lord Buddha and these are his remaining proportions’. He expressed all that with just three words. Sinhala language is so rich that it can express complex and long sentences with great economy of words. There are other examples as well. In English language ‘experience’ means the ability to absorb and note the incidents, scenes and natural phenomena. The wonderful thing about Sinhala is that there are four meanings to this word; experience is to know yourself, to know what you can do and can’t do, to find out the meaning, and also about the termination. Q: Do you feel that current generation of youth is shying away from classical Sinhala Literature and arts? What is the reasoning behind that? A: You should impart knowledge in such a way that the student’s attention is drawn towards the master. I don’t blame students; I think it is fault of the masters and teachers. You have to teach subject matter through interesting means so that the student could grasp it to the full. The correct approach should be there. Cumarathunga did it through creative poems and riddles. But they don’t employ such means these days and make learning a tedious process for the student. The education system is also at fault. During Colonial rule we studied books like ‘Daham Gata Malaya, Subashithaya and Lokapakaraya. Those books were in our study, but now they don’t teach such rich literary texts to students and it has created a mess. Q: How did your affiliation with great maestro Cumarathunga Munidasa started? A: I was student at eighth standard when I went to Cumarathunga’s Piyasamara. Then I started to write poems for him. I sent him a set of poetic verses called ‘Piya Viyo’ which recalled some of the memories about my father who passed away. Most said there is no point in writing to Cumarathunga, he won’t take any notice and there is no use it. But I continued to post to Cumarathunga and he started to take notice. Q: Why did you change your name from Chandradasa to Sandadas? A: ‘Chandra’ in English means moon and dasa means a servant. Therefore Chandradasa means, ‘to become a slave to the moon’. I felt that an animated person shouldn’t be a slave to an inanimate object. Moon is inanimate and why should a person become a slave to an inanimate object. So I changed my name to ‘Sandadas’. When you use the word ‘sanda’ there is meaning in that. It means ‘mind’, so when you say ‘sandadas’ it means this boy is endowed with a great mind. Q: Even at the age of eighty nine, you still have a crystal clear memory and a lucid recollection of all the subject matters that you studied, what characteristic powers this trait? Is there a specific attribute which contribute to this trait? A: You must be endowed with the gift of sustained attention. To get good knowledge, a person must be endowed with the sustained attention, if the sustained attention is not there, a person cannot become the master of knowledge. Even Socrates has commented on that. When you do something, give full attention to it, while giving attention, you can’t think of anything else. Q: You have written books about Goddess Paththini and various other cult beliefs, is there any scientific truth to these beliefs? A: I am a firm believer of Goddess Paththni. Because of my attachment to goddess Paththni and reverence to Lord Skanda wonderful things have happened to me. I had a sister who used to get a terrible fit and she used to fall in the ground shouting out. Once while she was doing that at night I found an upper portion of a goddess in ground. My mother said be-careful and not to tell anyone about my revelation. Second day I saw the same lady in a dream. While sleeping I saw the same lady going down to Thissmaharama Dagaba worshiping and dancing, and then she again went to Kirivehara to worship and dance. The dream hit me hard and after seining the dram we made oblations to Goddess Paththni in Katharagama. And second day after our oblations my sister recovered from her illness. Q: Some of your great literary translations have not been published yet. What is the reason for it? A: I have translated Parangi Hatana and Daham Gata Maalaya into English. And also I have translated Edwin Arnorld’s Light of Asia in to Sinhala. I have written another analytical book on Diverse Cult forms, but none of these books have been published yet. It is a real shame. I think publishers and editors don’t see the value of their content. Recently I sent some articles for Sinhala newspapers which they didn’t publish. But when I wrote for English papers, they did. They knew the richness of their content and published them. As for the books, people aren’t aware of the richness of these content and these works need to get across to the readers.